McKillop storms to victory on Sunday. THE WEIGHT OF expectation can be a heavy load to burden and Michael McKillop has been shouldering it for the duration of his career. When it hung over him inside Rio’s Olympic Stadium yesterday, he responded emphatically. But, afterwards, the bubble burst. Standing in the mixed zone, McKillop — with the tricolour draped over him and the gold medal around his neck — fought back the tears, pausing for a moment to gather himself before revealing the depths he had plunged to before Rio. It had all been building up for quite time; yesterday was just the emotional manifestation of months of frustration, anguish and worry. “I’ve come through a really tough time,” he said, with tears in his eyes. “In the dark times you realise what life’s about. It’s not just about gold medals. It’s about living, and I’m proud to live the life I have. I’m lucky, very lucky. “I’ve travelled the world and experienced a lot of things and competed against able-bodied people that don’t get to to Olympic Games. There would have been genuine concerns that he wasn’t going to even make it to the start lane on Sunday. A month ago, McKillop went to the able-bodied Scottish Championships in search of form and fitness. He ran 4:31.39 to finish 13th over 1500m. He had slumped to a new low, injuries and the mental strain taking its toll. “I came across the line flat out and couldn’t get out of bed for the next couple of days, I struggle with B12 levels, I was at rock bottom,” he recalls of those difficult days. “In five weeks I turned it around. I knew mentally I could go out with a positive attitude regardless of how fit I am. Living up to people’s expectations is always the hard thing. It was really, really tough. The vitamin B12 deficiency was manageable, although far from ideal in the weeks leading up to a Paralympic Games, but a debilitating foot injury threatened to derail his T37 1500m title defence and pull him under. “Nobody knows but I had a foot problem for the last three and a half months,” he explained. “I couldn’t get out of bed in the morning without it being really sore. I had to get my foot mobilised every morning in Rio but once again nothing was going to stop me from getting on that start line. There was no evidence of the problem yesterday as he produced a composed and commanding run under the Brazilian sun in the Olympic Stadium. Although it wasn’t quite like Beijing or London; there was a new kid on the block. 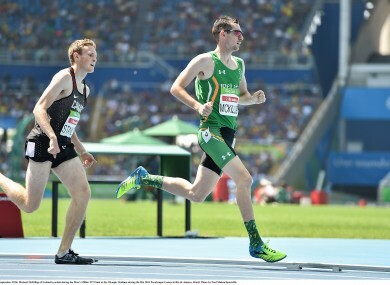 Canadian Liam Stanley asked the question of McKillop, only for the defending champion and world record holder to lay down the law again; this is his territory and he’s not prepared to give it up just yet. “It was a way tougher race than I thought it would be, it didn’t go to plan,” McKillop admitted. “The Algerian took it out, and I don’t think anyone expected that. It made for an exciting race, especially on television it would have looked a bit better. “It made me work for it and I like a challenge. I always put my front foot forward and showcase that it doesn’t matter what efforts other people will do, I can always come out on top. I know I am the best and I wanted to show that I am still the best. But he’s not finished yet. Already on the agenda are next year’s World Championships in London and Tokyo 2020. Why stop now? “I want to prove to people Paralympic sport is getting bigger in Ireland and showcasing that,” he adds. “It doesn’t matter that I have a disability, as I said I competed in able-bodied back in the day, represented Ireland in 2009. I want to get back to where I was then, I want to run sub 3.50. Consistency, longevity and supremacy are three hallmarks of any true champion. Michael McKillop has them all in abundance. Email “'Nobody knows but I've had a foot injury for the last 3 months. I couldn't get out of bed in the morning'”. Feedback on “'Nobody knows but I've had a foot injury for the last 3 months. I couldn't get out of bed in the morning'”.